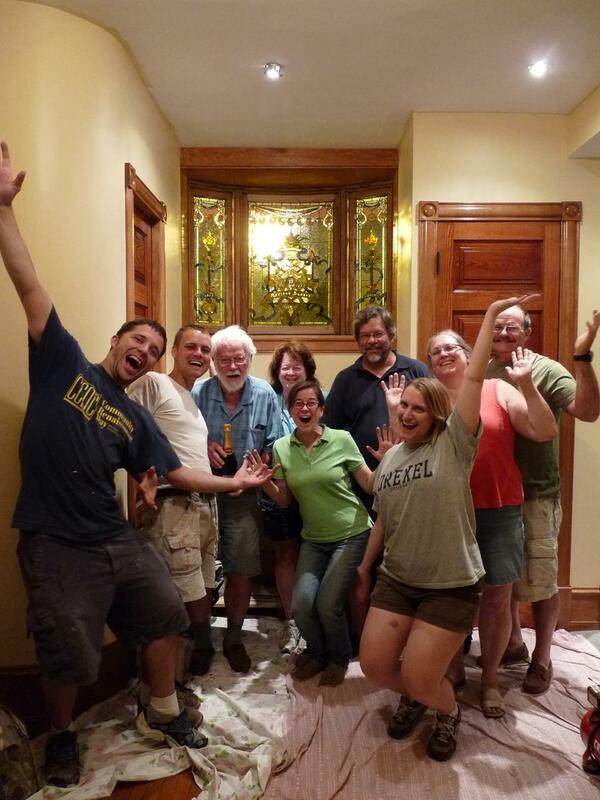 So we are finally getting around to posting the exciting details of our stained glass window installation… As you may remember from the previous posts the day started with removing the plywood that filled the openings for the last couple decades, letting the light once again stream into the living room! That was amazing but what was left around the window frame was not. When they infilled the openings they just hacked apart the wood sash, removing the curved stop, so they could fit a straight piece of plywood into a curved opening. So we had to rebuild areas of the sashes with new oak that we milled on our router table to match the old. To make it curve, we soaked the wood and kerfed the back. Always a challenge but it turned out well. The wood stands out here but once we stained it, the new areas blended in nicely. 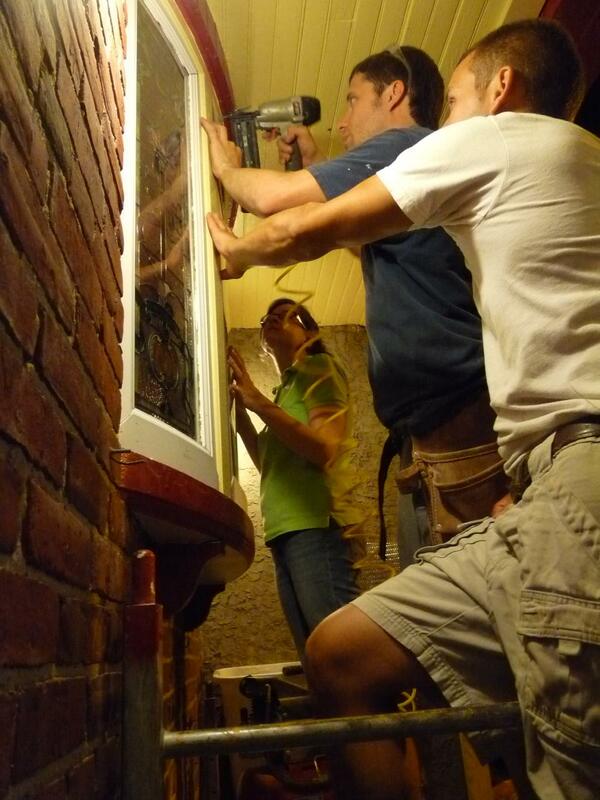 A few nails were also needed to tighten everything up before installing our new windows. 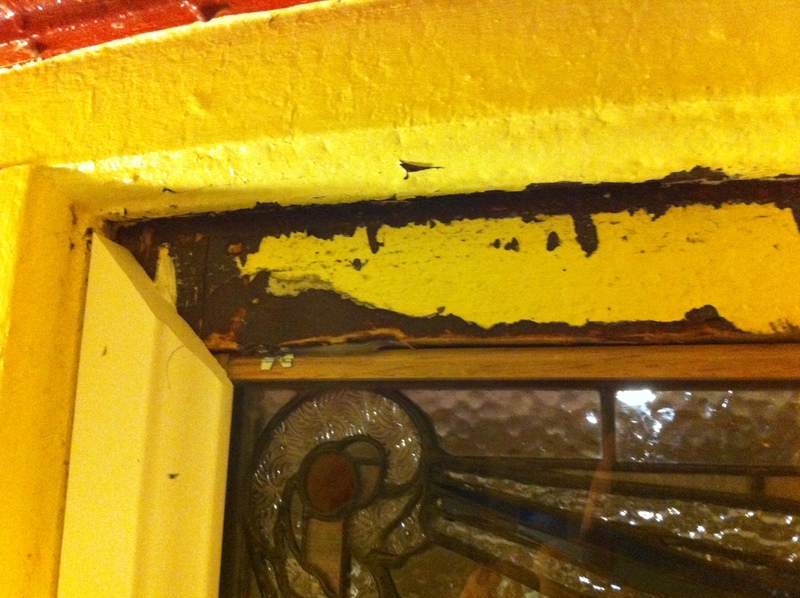 To create a new stop on the outside of the sash, we used new PVC trim for low maintenance. We precut and labeled all the trim so it would be ready to go. 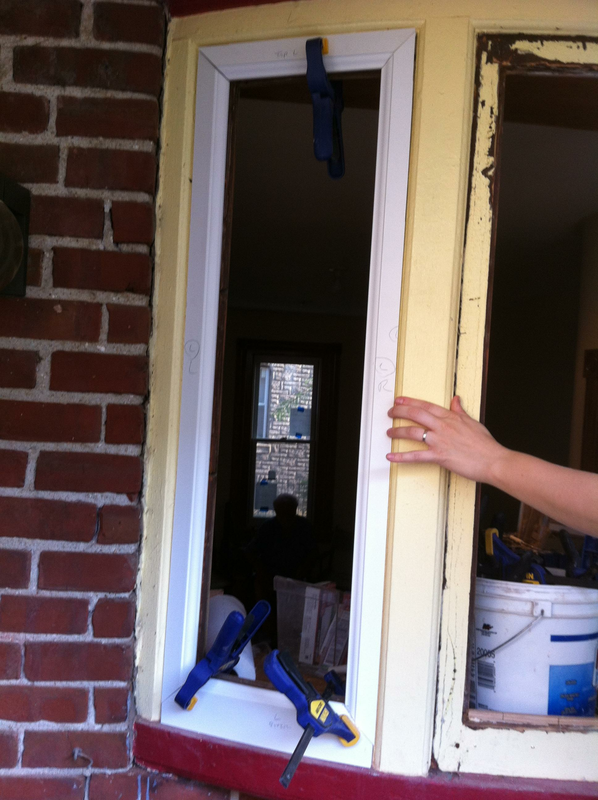 Because the double pane window is so much deeper than the original single pane glass, it was easiest to just completely cover over the old sash using its full depth for the two new panes. So when McElf arrived with the works of art there was a lot of excitement in the alley! 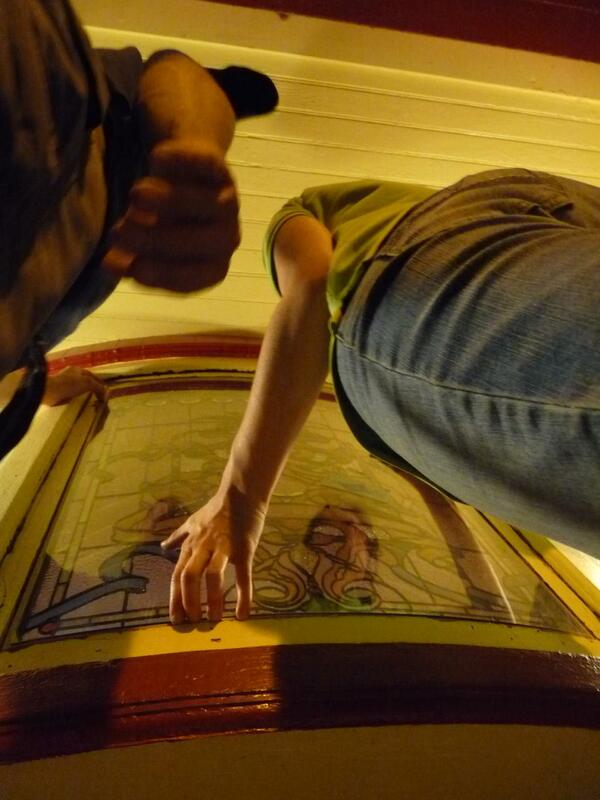 We of course couldn’t wait to see them and had to pull out one of the side windows to get a sneak peak….ooooh ! The windows traveled from Buffalo, NY on these extremely sturdy plywood forms that Megan had built to our exact radius to construct the windows on top of. It was great to get double duty out of the forms. She then sat them on thick foam for additional padding. And in went the first window! It fit perfectly on the first shot and we anchored it with glazing tacks. 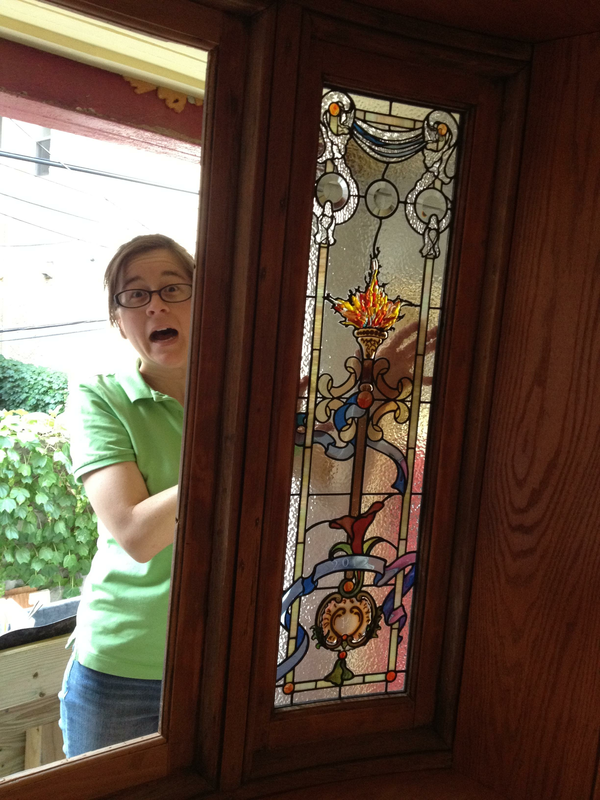 You can see from Megan’s face how nerve racking it was to handle these precious windows. 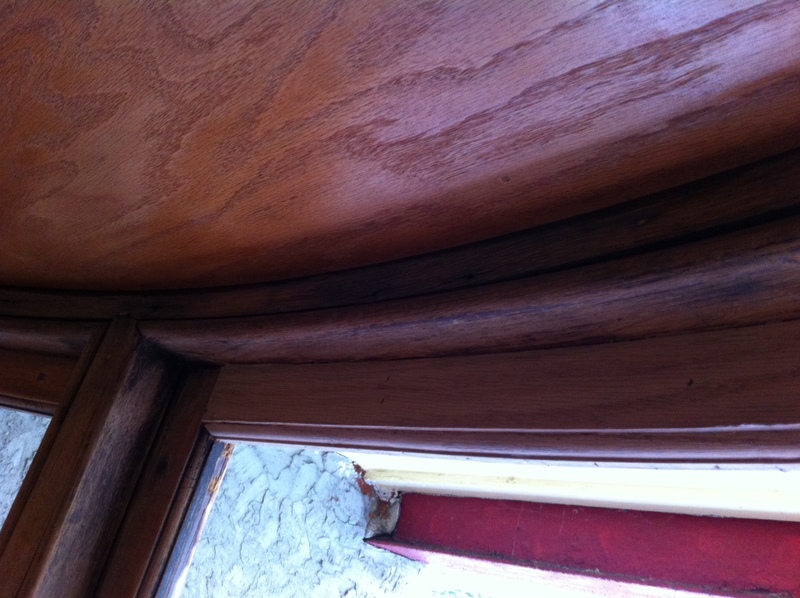 We then installed thin oak spacers and did a real thorough cleaning of the glass since we won’t get another chance. You can see we are constantly dealing with curving everything, having to kerf the spacer. Next came the outer sheet of curved glass right against he spacer. Again great care was taken, since if we broke it was not like we could run to Home Depot to pick up another sheet! The last step was to install the outer trim/ stop. We installed it in a thick bead of silicon. 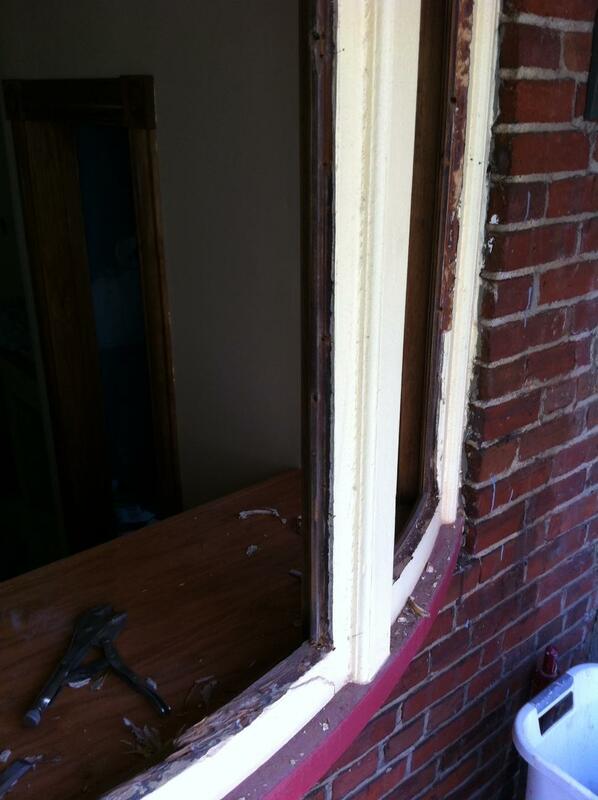 When finished the outer glass, trim, and sash will all the sealed together. 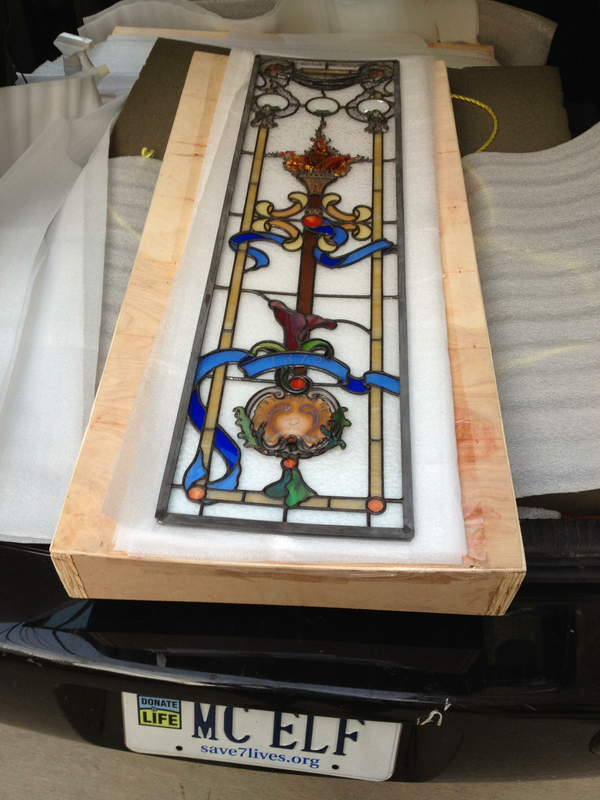 The inner stained glass however will be able to breathe to the interior to prevent condensation between the panes. The first window took the longest, perfecting our technique. 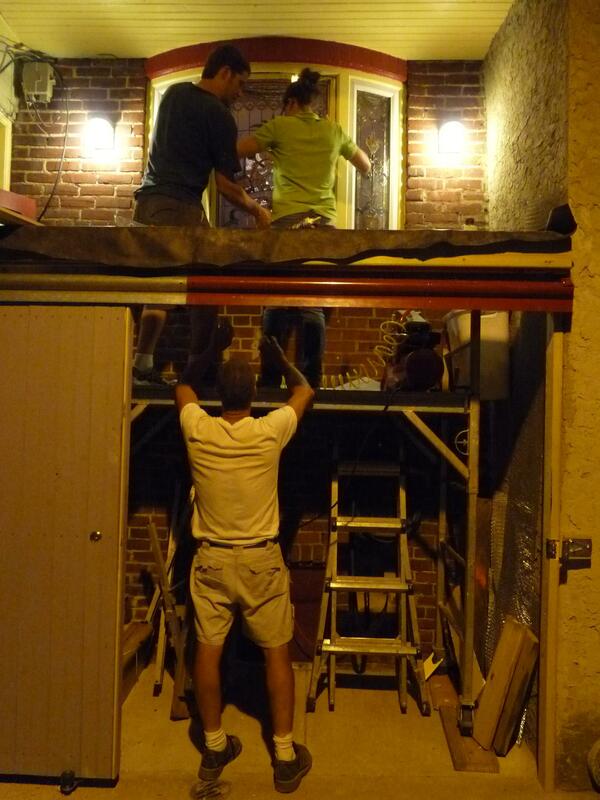 Next we did the other side window so we could work up to the big center finale. For doing the work we set up scaffolding below the window, and Megan’s boyfriend Chris would very carefully hand the glass up to us. Thankfully, the stained glass pane for the center went in fairly easily, but the outer pane was constantly a challenge. There was not much of a ledge to support the outer pane on until we had the new stops in place. 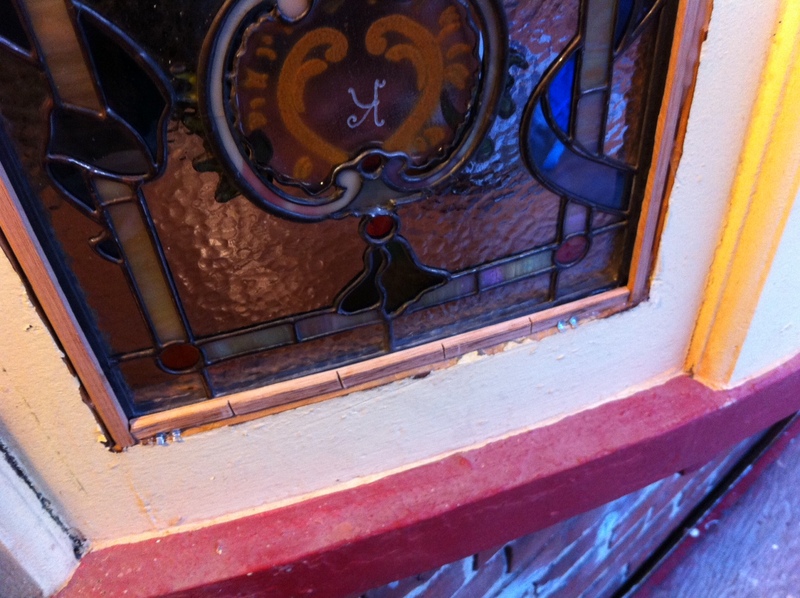 On the center window, the outer glass could also have been a little wider. We didn’t quite add enough to the arch length to account for the larger outer radius, but hey, how often do you order custom curved glass windows for your house? Either way we made it work. 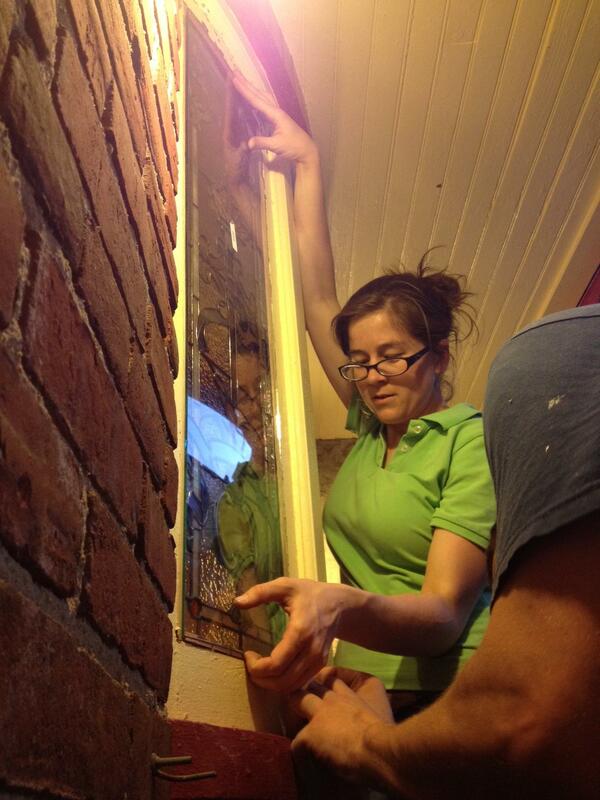 With a few extra hands, the glass stayed in place and the trim went up locking it in forever. 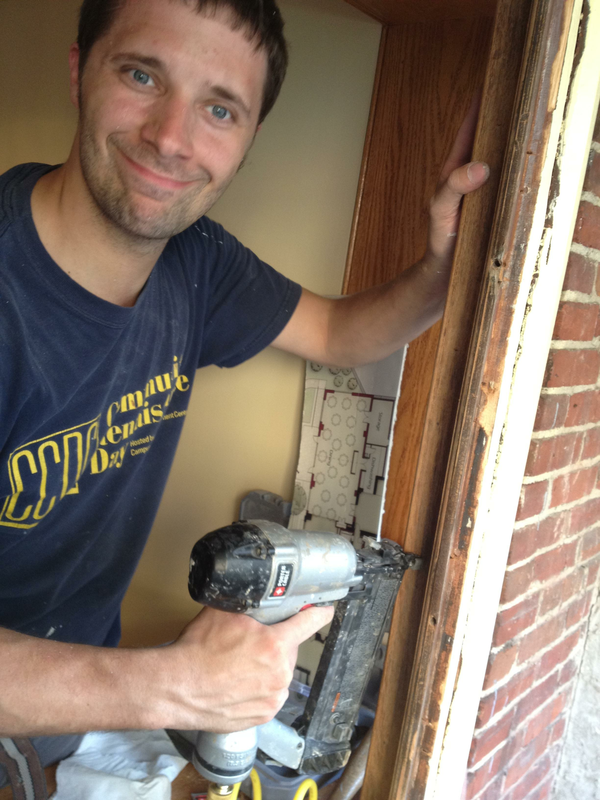 We definitely appreciated having a nail gun on this project. It was quick and we don’t have to hammer right next to our new window! And we were done… what a day! The culmination of months of design and endless hours of hard work by McElf cutting, grinding, bending, assembling, banding, and soldering every piece of glass in that window. Megan’s family and Kelly’s family were both there all day to watch the ‘exciting’ installation and celebrate the completion of this wonderful project with us… Cheers! Sorry we missssed the installation party!!! The stained glass window looks GREAT!! 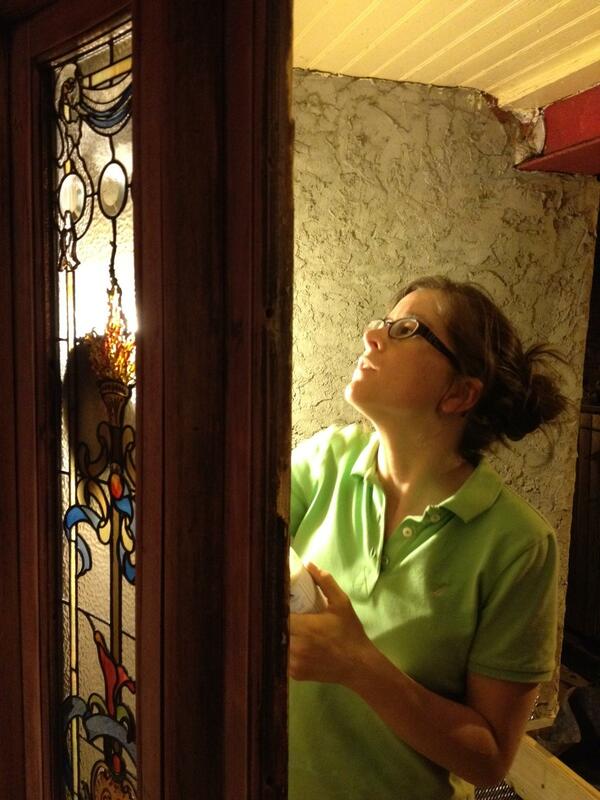 This past week I was telling a local stained glass artisan(sp? 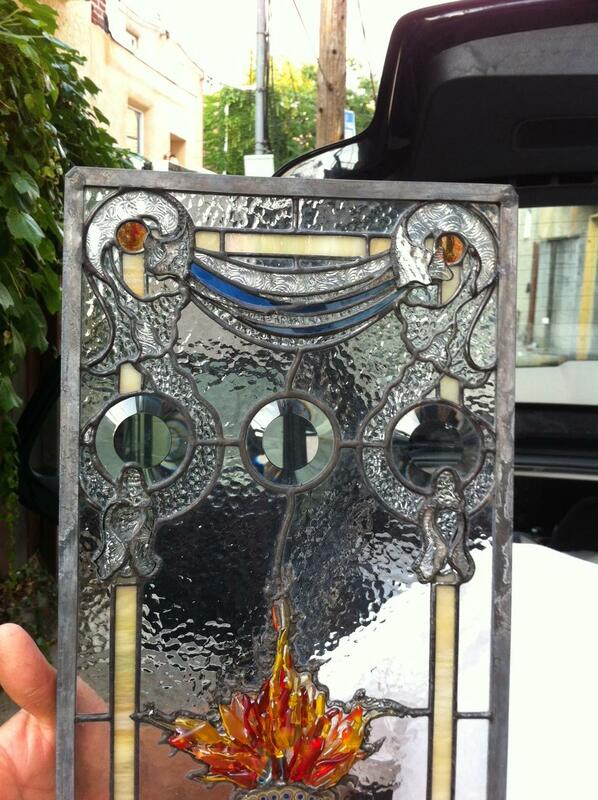 ), that has done alot of repair work on our stained glasss pieces, about your window project. If you dont mind, I am going to forward him the final stages of the project, Again, JOB WELL DONE!!!!! 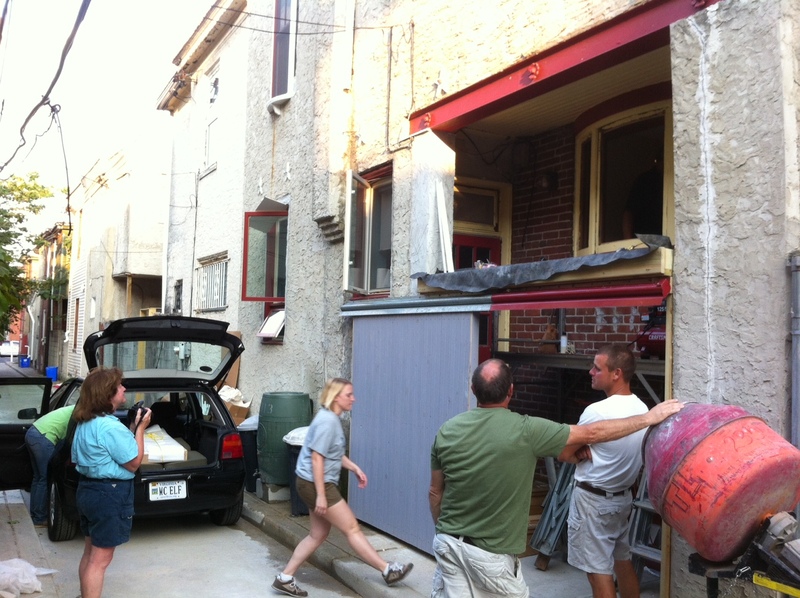 This FALL we are going to make a weekend trip to Philly to see progress since we last visited the two of you.